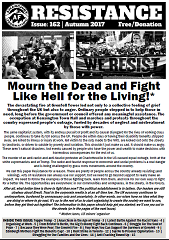 POST-ELECTION SPECIAL ISSUE: This issue contains reports of people fighting along side refugees and asylum seekers, winning against their dodgy landlords, and acting in solidarity with people sleeping rough. All this is being done without the wet blanket that is Jeremy Corbyn or the hope-filled lies of political parties. GENERAL ELECTION SPECIAL ISSUE: What anarchists do instead of voting, Labour and the Unions, Lib-dems: a student’s view, Green Party “Tories on Bikes”, Syriza in Greece, Suffragettes, Russell Brand. FEMINIST STRUGGLES SPECIAL ISSUE: Ireland and Spain abortion struggles, Legal battles, Gender and Factory Resistance in China, Women & LGBTQIA in Ukraine, Free Women of Spain – Mujeres Libres 1930s. Sexual harassment at work, Transgender tipping point, Angry Women of Liverpool, Single mothers fight social cleansing in East London. WW1 COMMEMORATION SPECIAL ISSUE: 1914-2014 The Great War Continues, WW1 mutinies, Feminism & War, and more. 16 pages. NEW: read article from this issue in Russian. NOVEMBER 2013 RESISTANCE is out. AUSTERITY HITS HOME (economic crisis), Anti-fascist killed in Greece, Food banks, London Day School on Anarchist Communism, Brazilian anarchists, Bangladeshi Clothing Industry strikes, US Anarchist Jailed. SEPTEMBER/OCTOBER 2013 RESISTANCE is out. 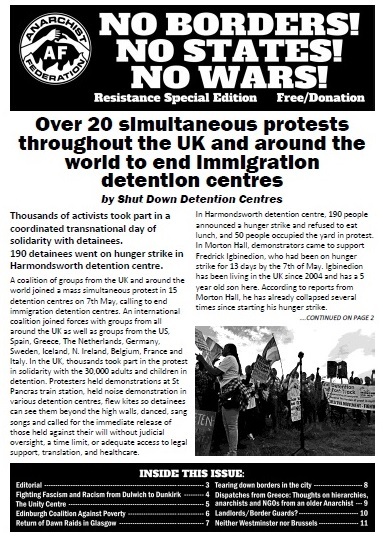 MASS ARREST at EDL London counter-demo, Anti-fracking action at Balcombe, SeaSol solidarity group success, No borders in Greece, Russian anti-fascist prisoner appeal.